Citations, also referred to as local business listings, are an important building block for ranking your dental website in search engines like Google. Citations are references from websites to your business’s Name, Address, and Phone number (NAP). Search engines consider these NAP citations as signals that you are a legitimate local business. Local SEO experts concur that citations have a 13% impact on local SEO rankings, which goes to show just how important they are as part of your Local SEO efforts. You can read more about local ranking factors in Moz 2017 Local Search Factors Survey. 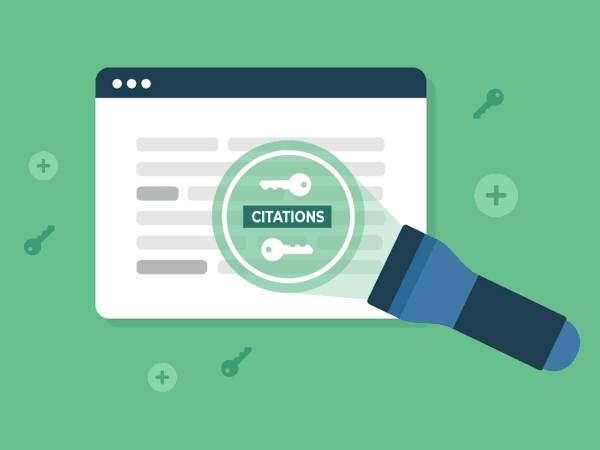 Why are citations important for dental practices? Most dental practices naturally tend to pick up citations. This occurs as a result of being listed in different types of official business and medical directories, and people often post links to the practice address and phone number online. These references can get corrupted over time or, if they get listed incorrectly in one of the major data sources, they can cause errors in multiple sources that search engines reference. There can be hundreds of citations for your average dental practice and we’ve seen some very messy citation profiles. Citations can accurately inform or confuse Google when it comes to ranking your dental practice. Google wants to be certain about the websites it shows in its search results so it prefers to show websites that do not have NAP issues. Cleaning up these profiles can offer a relatively easy boost in rankings and, in some cases where there have been a lot of issues and poor rankings, potentially a big improvement. It has been our experience that most dental practices need to clean up their citation profiles and add some of the important citations that will be listed later in this article. Cleaning up your citation profile is essential if your business has ever changed its name, location, or phone number. 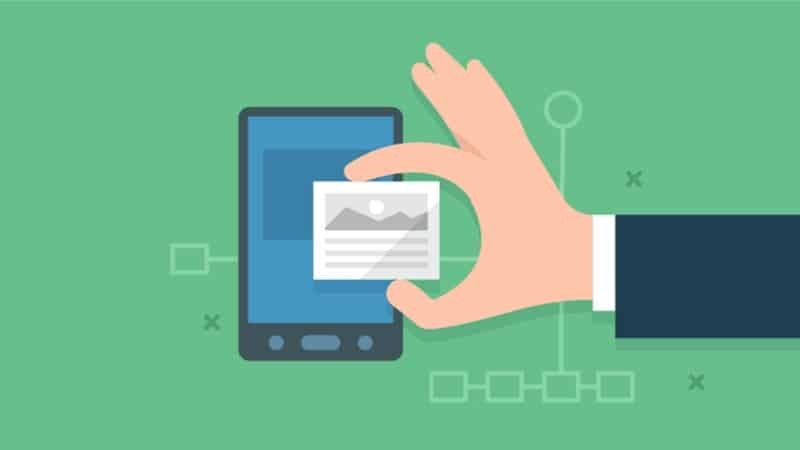 It’s important to plan for any of these changes with a professional SEO company if you want to keep your rankings intact. In our previous post on inbound links, we mentioned citations. While citations and links are different, dental practices need both inbound links and citations to rank well in the search engines. Links and citations are similar in that they can both be links from outside websites that point to your dental practice website. They are also similar in that they have a strong influence on how your website ranks. Both can also have a negative or positive effect on your website rankings if they are set up incorrectly. Citations are different in that a full citation always includes your Name, Address, and Phone number (NAP) on the page, whereas a link can come from any webpage with any type of content. Links are always clickable but citations can sometimes only include your NAP data in the listing with no active link to your website. Links are valuable for organic SEO (the links below the local listings) and local SEO (the maps related 3-pack at the top of the listings). Citations are valuable primarily for Local SEO. 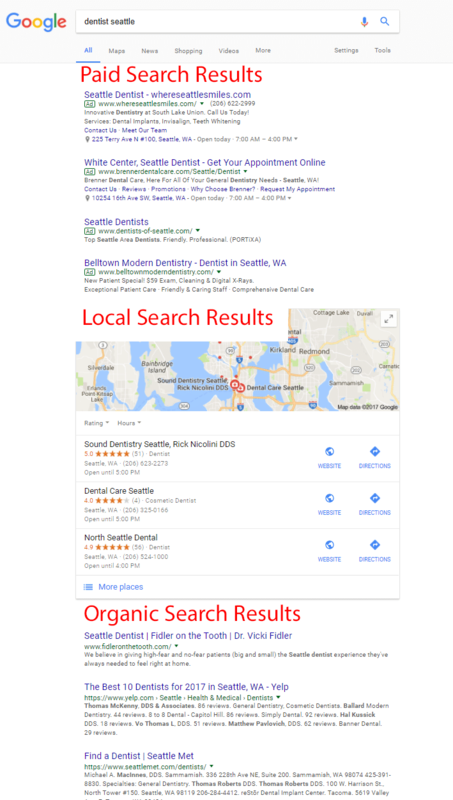 You can read more about the difference between organic and local SEO in our article on Local SEO for Dentists. The image below shows the different areas of the search results pages. Note: these example links do not point anywhere. Contact Neptune’s Galactic Dental Practice for out of this world dental implants. Images and media can also contain links. Dr. Neptune is located at 99 Interstellar Way in Solar City, California. His phone number is 555-555-5555. Full citations will include the entire NAP data. Partial citations only mention some of the NAP data. A full citation is always preferable. Google is getting better about noticing and tracking partial citations and this will likely improve over time. One important SEO consideration is the use of call tracking numbers. Improper use of call tracking phone numbers can create inconsistencies that can cause issues with your citation profile and ranking, so we recommend only attempting this with the help of an SEO professional who has experience implementing them. Another issue is keyword stuffing in your business name. If you create any confusion around your business name in directories, your rankings can suffer. Duplicate listings can sometimes be created if you try to add artificial keywords. Keyword stuffed listings also tend to get flagged by competitors. This is no longer a useful tactic for sustainable, long-term listings. As we have discussed, links and citations are both important, and they offer different value to the search engines. The search engines do consider them both as endorsements from other websites or organizations. The more important that website is, like Yelp or the ADA, the more authoritative the search engines will consider that endorsement. Citations can also be a valuable source of website traffic. People search websites like Yelp, the Yellow Pages, and local or industry directories for business services they are interested in. Many people turn to Yelp or Facebook first to find local dentists with great online reputations. These are valuable citations. The most important part of managing your citation profile is keeping your NAP consistent across all of your listings. Local SEO experts agree that consistency is one of the measurable ranking factors for local websites. This is one of the reasons you don’t want to use a call tracking number incorrectly or stuff your listings with keywords. Discrepancies can also create duplicate listings which will cause serious issues with your NAP consistency. How many citations does a dental practice need? 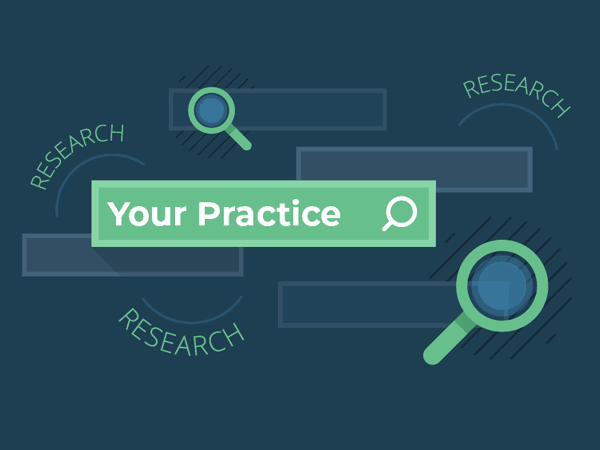 Your link and citation profiles will determine how your dental practice ranks against your competition. If a competitor has more links or more citations, it’s likely you will rank below them. Top-ranked local businesses have an average of 86 citations according to a recent Bright Local study. Most dental practices have a variety of citations but the number does vary. Just like citations, links are considered a key ranking differentiator. 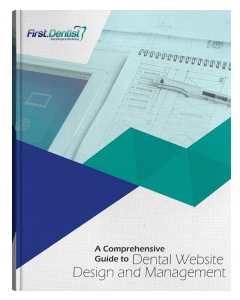 In our experience top ranked dental websites have around 10 to 20 high-quality links and 20 to 30 medium-quality links. Most top local dental rankings do not require a huge number of links, but we always recommend benchmarking and researching your competitors. Some markets are much more competitive. First.Dentist offers free strategy sessions where we will review your links and citations. You can also set up a Bright Local account on your own to get a list of your citations. The value in having great link profiles and great citation profiles is that you’ll rank well in local maps area and organic rankings area. Combine these results with Google Ads (pay-per-click) advertising and you can be seen four or more times on the first page of Google – this is an incredible marketing advantage for local dental practices. We’ve created a Local SEO case study for one of our pediatric dental practices that have achieved this optimal marketing positioning. This type of positioning can dramatically improve the flow of new patients into your practice. There are innumerable citation sources on the internet, but we encourage you to be discerning in the directories you choose. Low-quality directories can be viewed as spam, particularly if they aren’t relevant to your industry or local area. First.Dentist has a list of the most important local and dental industry citations and we make sure our SEO clients are added to those directories. We’ll share a few those later in this article. You also want to be careful how quickly you build citations if you build them too rapidly search engines may penalize you. Data aggregators are business data collectors. They include companies like Yellow Pages, Infogroup, and Factual. They confirm local business data more thoroughly than smaller online directories. Google and other search engines license this data from the top data aggregators and use it to confirm information about those businesses. Google will usually use these citations to confirm other citations online. Many other online directories use data aggregator information to populate their citations, so incorrect information can spread NAP inconsistencies throughout the web and cause major problems for local businesses. This is why it’s very important to make sure your information is correct in the major data aggregators. We’ve seen practices update their citations only to have them replaced again with the incorrect information from one of the aggregators. Confirming the NAP data in the data aggregators is one of our first steps when we are setting up a new SEO client. There are services that First.Dentist uses that can check and update all these sources as part of our SEO packages. You can manually go through them, but some are expensive to update (Neustar/Localeze). Contact us if you would like assistance with this process. It can be tedious and time-consuming. It’s better for you to focus on dentistry and running your practice! Google crawls local business directories for local business information as well. Yelp and other local directories like Yellow Pages offer a benefit to your citation profile, so make sure your data is properly updated there. Local citations are useful in helping Google determine you are a local dental practice. Some of the more valuable local citations include your local Better Business Bureau, Chamber of Commerce, and neighborhood business associations. Local media directories can also be helpful. Check your local newspaper and other popular online media sites for their local directories. It is important to monitor citations because some citations allow for public input that can change details which can lead to problems; such as nefarious phone number changes. Dental practices can spend a lot of money adding and creating these citations. The most important consideration is not just Google, it’s also your customers. Good citations are not solely for the benefit of search engines, they can also bring website traffic and new patients. Make sure that your practice appears where your competitors show up. You’ll definitely want to be listed on sites like Yelp, HealthGrades, Facebook, and the Yellowpages. Citations are considered a foundational part of Local SEO and they are a clearly are an important ranking factor. Google’s local algorithm is becoming more sophisticated by the day and experts suspect it has started to include factors like Maps usage, Google My Business interactions, and even location tracking from Android devices. As these signals get stronger we expect the value of citations to decrease. That said, citations are foundational pieces and are worth putting in the effort and time. 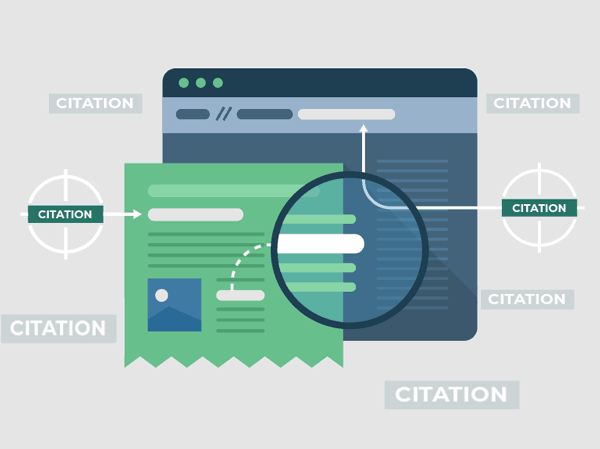 Once your citations have been properly cleaned up and the most important citations have been added, you won’t see a lot of additional benefits adding a lot of citations. We think that citations will remain a foundational and critical part of Local SEO far into the future. While there are numerous paid citation services, we recommend working with a company like First.Dentist. We have the industry expertise to evaluate your citation profile and help you prioritize the work. Citation management is included in all of our SEO packages. Contact First.Dentist for a free review of your citation and local SEO rankings. 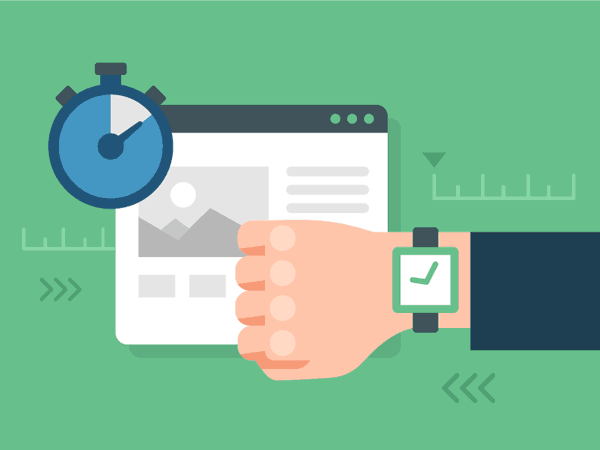 We’ll also benchmark your competitors in a valuable free 1-hour strategy session.